On Sunday Bill English announced a co-investment of up to $600m for network infrastructure needed to support more greenfield growth in north and south of Auckland. This will be through a Crown company called Crown Infrastructure Partners (CIP), formally Crown Fibre Holdings. CIP is a special purpose vehicle (SPV) that has the power to set up companies to build and own the trunk infrastructure needed for housing developments. It can then recoup revenue over a longer time period from from councils through targeted rates and volumetric charging. The SPV’s will not be limited to Auckland, however, it made sense to roll them out here first. The creation of a SPV was needed as the announcement of the Housing Infrastructure Fund (HIF) just over a week ago were loans from Central Government. This was an issue, particularly for Auckland due to the Council already being close to the revenue to debt ratio limit. This meant that Council could not take on too much debt, thus limiting the potential impact of the HIF for Auckland. With this new structure the debt sits on the SPV’s balance sheet rather than the Councils and the revenue is from those direct sources so the debt limits don’t become an issue. This funding is needed as without the trunk infrastructure, many developments simply cannot feasibly go ahead. Its homes built not consents issued that really matter. The Government believes this investment will accelerate the development of 23,300 homes, including 5,500 homes in the north in the greenfields at Wainui and 17,800 homes in the south across Pukekohe, Paerata and Drury. In addition they claim it will facilitate 5,000 jobs in a business park development adjacent to the Stevenson Drury Quarry itself out of around 15,400 jobs across Auckland as the wider impact of this development. This is exected to add $2.3 billion in total to the regional economy every year. The projects mirror closely what we have already seen mentioned for Transport for Future Urban Growth (TFUG). It is great to see a commitment to new rail stations at Paerata and Drury West which will provide a congestion free alternative for these new residents instead of the gridlocked Southern Motorway. These stations will be timely too, and work in combination with Auckland Transport buying battery trains to extend the electric services to Pukekohe. The $60m for two the stations does seem fairly expensive though given I would assume these would be pretty standard suburban stations. It’s also unclear why the other new station planned in the area, at Drury (east of the motorway) is not being built at the same time. It is also good to see the removal of a level crossing seen as a priority and hope that this is only the first bit of funding to eventually remove all of Auckland’s level crossings. I’m not entirely sure why the Curley Ave bridge is so expensive for what appears to be a relatively short piece of road. Like with the HIF, the sole focus of the Government seems to be on greenfield growth with nothing to help enable large urban redevelopments. Further, a large percentage of the funding still going to roads. Where is extending the Busway further north from Albany for example? It is very clear Sprawl is still King for this Government. Nearly 9 years of National Party denial that Auckland has a housing crisis leads us here. Almost a year after Keys promise of a billion dollar infrastructure fund. It’s very clear that in election mode and having achieved next to nothing with their loophole filled brightline tests and hollow special housing areas, consumption of Kiwisaver on deposits etc, etc, that this is another attempt for National to look like they are doing something. And worse, word is this $600,000,000 is coming from a Housing NZ dividend, once meant, one would hope, for social housing. So developers get this early Christmas present, margins and therefore profits will be up, donations repaid, houses will be no cheaper and the expansion of Auckland footprint continues but yet fails in its objective to sate supply. And the southern motorway groans even more. Leith concludes his analysis of NZ’s housing market with the following statement. “Labour’s housing policies are certainly far superior than anything offered by the National Government, promising fundamental action on both the demand and supply sides. The National government do not get cities, they have been, ‘too little too late’, on the two big challenges of our growing cities -housing affordability and traffic congestion. They needed to be dragged kicking and screaming into providing the CRL for Auckland. Yet they still have not learnt their lesson that ‘car-only’ sprawl is unsustainable for Auckland right now and in time unsustainable in NZ’s other growing cities -Greater-Christchurch, Tauranga, Hamilton…. The government should learn from the mistakes of Auckland, not repeat them. The National government demonstrates this ‘not getting cities’ by its continued obstinance in not providing the North West of Auckland and North of Albany with an expansion of the express busway network. New Zealand cities need a fresh approach, with new politicians like Julie-Anne Genter, Phil Twyford, Michael Wood and Jacinda Ardern who understand cities. Well, yes, with a PM who is a dairy farmer, and electoral support all from the rural areas, National certainly don’t have an interest in cities. Time for a change indeed. Look at the main players in Bill English’s kitchen cabinet. It will be the ‘old-boys’ network of Nick Smith, Stephen Joyce and Gerry Brownlee. None of them have demonstrated in the nearly 30 years of parliamentary service that they understand cities. Paula Bennett and Paula Bennett are newer Auckland and Tauranga faces for the National government -but I am yet to be convinced that they are introducing greater understanding of cities into the National party. I think it has been a long time since we had a government that understands cities. The Clark government had to be dragged kicking and screaming into funding rail electrification and were quite happy to watch house prices go to levels we all thought were high in the mid-2000s. They also got the motorway building programme back up and running. Hopefully the government that follows this one will be more urban focused. I don’t hold out much hope though as Peters who will be very influential (possibly PM) in any change is more about the provinces. Jezza I am not sure we have ever had a central government that understood cities. I would argue some of the Provincial governments did -Canterbury in particular did a good job of laying out Christchurch city -with the exception of the location of the central train station. The initial plan was to connect the port in Lyttelton with Christchurch by a canal down Linwood Ave -the train tunnel through the Port Hills was an ambitious and successful afterthought. If Clark had given Auckland (and other regions) the taxation power to fix their own infrastructure deficits, 15 years ago from in 2002, then NZ cities in my opinion would have been in much better shape to cope with events like disasters, earthquakes, traffic congestion and housing affordability. The Auckland Council and the Government have already shown they can work together successfully. Together they created the housing crisis, the Council by banging on about housing choice while actually stopping houses being built, and the Government for its part has flooded the city with new people with full bank accounts who were able to bid up house prices. Let ‘s hope they can also work together to fix it. I wouldnt say sprawl as that is disingenuous given the land announced is Future Urban Zone land under the Auckland and Unitary Plans. They were always going to go first until the Southern and Central Interceptors were brought up to speed to support more Brownfield developments. That said Housing New Zealand and Panuku are leading some of the biggest Brownfield developments (600ha in Manukau is not to be sneezed at) and I did get told Brownfields were up next with the SPVs. As for the station out in Drury South – I’d say that will be covered by Kiwi when they develop their Town Centre out there. Ben you have a tendency to lean on technicalities; this is sprawl. It is the outward spread of an urban condition onto currently rural places. That is sprawl, whether in a plan or otherwise. However, and indeed, at least it is planned sprawl, and more importantly coming with a timely connection to a functioning (and much improved in around 2 years) Rapid Transit Service. So, in contrast to the ghastly mess being built around Pokeno, for example, this is a vast improvement. The same cannot yet be said for its northern counterparts. With the South at least and for once we are getting the infrastructure ahead of the major builds. Two new stations, new trunkline pipes and the 17 B-EMUs. I wish Councillors like Cooper would see this and why we have critiqued the North and North West so hard! It is not because we “hate it” it is because it is more of the same that got us into the crap in the first place. The South at least with Greenfield could be the example of a change in planning in that we get the infrastructure AHEAD of major developments rather than behind. Instead of that long “new road corridor” to Pukekohe, they should make that a cycleway. Pukekohe already has a road in – adding another will just induce traffic and encourage big distances between houses and services. With the added rail infrastructure, Pukekohe could be saved from the worst kind of sprawl, and could have a really interesting, dense development. Even on its existing footprint. But that won’t happen because of the new road. Such a shame. Sorry, I forgot. 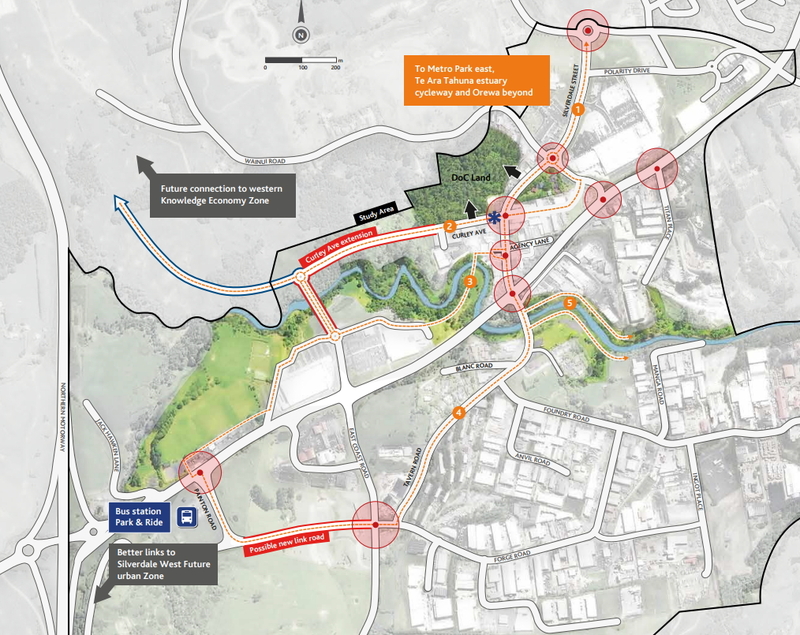 NZTA says the traffic will happen anyway, because of the development. Nothing to do with whether they put a road in. Silly me. Yeah because your typical cycle commuter cycles long distances. There are 5,000 jobs in the Drury development, all with 3 km of the 15,000 homes. Those are all cycleable. Just like a road, long clear connections are good for cycleways as they are legible. Ever studied the travel patterns of women, TRM? The commute is but a small part of travel planning. I commute that way by bike 3 to 4 times weekly.combined with the train it makes an excellent 45 to 50 minute commute. Infrastructure like a bike path up the valley the train runs through would be a great ride. And as for their much anticipated Ultra Fast Broadband promise, circa 2007 using the private sector “to do the heavy lifting”…..where is it in 2017 cause it ain’t even made it 5 km from Auckland CBD! It’s at my place 9km from the CBD. I’m 8km out and fibre was available on the _other side of the road_ for several years before our side. That said, if I signed up to a business plan I’d have been able to get it very early on. I agree that the UFB rollout was a shambles, it smelt of cronyism and seemed obvious that the end result would be sub-optimal. Funding is almost up. If you don’t have fibre soon – Who knows what will happen. Another election sweetener from the Nats, a commitment to continue funding the UFB roll out. It’s been a dream compared with the shambles of the NBN rollout across the Tasman. I am 20km from Auckland and it is my street but all the available slots are gone. Chorus has to come back and provide more. I’m 434km out of the Auckland CBD and it’s in my street! Chorus were putting in the Fibre during January in my part of Havelock North. In fact in 2012 when I was living in a different part of Hawke’s Bay they were rolling out some of the first of the UFB Fibre to the street I was living in then in Westshore. How long is the train trip from Paerata to the city? Must be well over an hour. I wonder how many people would be happy with that commute? It will be shorter than Pukekohe where people happily commute from. The CRL running pattern has express trains, although I’m not sure how they will work without a third main from Papakura to Glen Innes. Also by the time these subdivisions are built, the PT network will hopefully be more connected, so transfers to airport buses at Puhinui and other buses across the network will be much more appealing. Why? You have asked about commutes to the city. The majority of these commuters already don’t drive. Why would people living in this subdivision be different? Is that a commute where both members of the couple are in the car at the same time!? haha good one jezza! From personal experience I can attest to the 45m+ being tough both with or without SO in the car with you. +1, also if you’re a parent, good luck with arriving home before your kids go to bed. Nick Smith rightly said a while back that there were many factors causing the housing problems. Yet in nine years we have barely seen action to any of them, just a bit of tinkering here and there. The housing spread in Orewa is having a bad effect on the motorway south of Oteha Valley Rd and it can only get worse. There is NO room to go wider past Tristram Ave, either direction. Unlike Ramarama there is no rail and no desire by central government to to do much else as an alternative. Same with Kumeu and Huapai. Greenfield developments cannot go on without central government money providing quality alternatives to cars. I am seeing none with this election bribe. +1, the busway needs to be extended at least to Silverdale as part of this. +1 It’s not as if we didn’t know what would happen with traffic when Orewa was developed. It’s not Orewa that’s the problem, it’s Millwater with is monumentally stupid suburban spaghetti street pattern that makes PT almost impossible. Orewa has been around for decades, Millwater has added thousands of drivers from scratch. There are fixes for these things but Auckland Transport, Auckland Council (incl councillors) and the Local Board don’t want to know. Their view is that the new bus station at Silverdale is THE transit fix for the area with busway extension to Grand Drive as a future project. Are the targeted rates a percentage of the property value, or a fixed cost? If they are a fixed cost, wouldn’t this be yet another reason to build more massive expensive housing? Think of all the materials suppliers who’d make more money from big houses. And all the retailers who’d sell all the stuff to fill up the big houses. Let alone all the business associated with all that stuff: advertising, freight, legal and financial services. We’d even be able to justify more roads to allow for all that movement of stuff and the various services too. Massive houses are good for GDP in so many ways. Must be good for us. There is a good article with a video of Bill English’s press conference discussing the targeted rate -infrastructure provision experiment here. It now seems both Labour and National believe that land-use restrictions (restrictions on building a city up or out) add to the cost of urban housing. Although in my opinion, Labour have the clearer proposed RMA -National Policy Statements about removing land use restrictions -while Nationals -NPS on Urban Development Capacity -removes restrictions slower/more incrementally. The debate now seems to be about how to provide infrastructure to this developable housing supply, so that the supply is ‘superabundant’ and not land banked. Also so that multi-modal transport options are provided from the ‘get-go’. What National is proposing with Crown Infrastructure Holdings is not new thinking, it is classic National Party steal the good ideas from the opposition rather than doing any hard-yards policy thinking themselves. This process indicates Labour on housing has been a successful opposition -so well done Phil Twyford. It would be nice if MSM would do some homework and give credit where credit is due. So the idea of a targeted rate/infrastructure providing entity is correctly identified as deriving from Municipal Utility Districts, which can be found in parts of the US. But there is some major differences. Both National’s and Labour’s proposed city infrastructure providing schemes are like a ‘nationalised’ version of Texas’s ‘privatised’ Municipal Utility Districts. Which means both Joyce’s Crown Infrastructure Holdings and Twyford’s Treasury run Infrastructure Bank (to manage his proposed municipal bonds and targeted rate scheme), both have the potential to be highly ideological and politicised. It raises the possibility that politicians problems with cognitive dissonance re housing affordability will continue. Politicians are trying to hold two mutually exclusive thoughts in their head at the same time. They want to believe they promote equal opportunities, individual freedom and choice, personal responsibility…. blah, blah, blah while also believing that it is ok to promote, through excessive regulation and inadequate infrastructure provision, the property wealth of important constituent groups. Personally I don’t see ‘nationalised’ MUDs as the final answer to infrastructure provision for the competitive supply of urban land in NZ. What is needed is a system that no one doubts will supply infrastructure when needed. In a weird way what is needed is politicians to show their political will by implementing a competitive/cost effective land and infrastructure system for growing urban areas that will continue without their continued political involvement…. I would say it is probably because it is on the side of a hill that is rather steep. It will require considerable earth works on top of the bridge costs itself. Much needed though as currently the only road is the highway through there which isn’t suitable for cyclists and is often slow for buses. It also runs through a swamp and will require a long bridge and I would imagine that they would bring Hibiscus Coast Highway up to modern urban arterial standards as part of that upgrade. Hibiscus Coast Hwy is getting another 2 sets of lights along here. Silverdale St – Tavern Rd and Jack Hawken Lane. It’s like the Wainui interchange, about 1.5km away, doesn’t exist. If we are going to get BEMUs, which mean we can go anywhere, is there any development planned along the Mission Bush branch that would make sense putting a station along there too? Announcing PT spend on new stations, in advance of the development, can’t be understated. Its real forward planning by National. It might be a first when it comes to PT, but fair is fair. Finally. Agree, possibly the first time a central government has forward planned PT in a new development since the Hutt Valley rail line in the 1950s. Ridiculous, isn’t it. From both sides of the political fence. that fact is depressing. Is that true? I can not think of any examples where they have planned for something and then built it since the 1980s. I think it’s just because it happens to be where the rail line is. There is nothing sensible like planning for PT in advance of development happening down here in Christchurch either -not even when entire suburbs (8,000ish homes) were abandoned and the residents needed to be rehoused elsewhere due to earthquake land damage. What are “improved connections to Waikato”?